The presence of monuments indicates a desire of men to make an abstract entity visible. The initial idea of a monument is contemplation, be it ancestor worship, some act of heroism, tragedy, or just to reflect the significance of the past. Some modern monuments have passed all these stages to make a declaration for the present or future. The definition of monuments in everyday language is not very precise. A coarse division can be made in the distinction between incidental and deliberate monuments. The former type consists, for instance, of old buildings or structures, which are ‘monuments’ in their own right. Their historical presence and value gives them a reason for contemplation. Why is this building still here, how did it escape destruction by nature or men? Maybe it was treasured for the simple reason that people liked its being, or more cynical, it was simply overlooked and missed the ravages of time by cheer luck. The second type is the monument sensu stricto: a deliberate artistic act of creation to commemorate an event or worship a person or event. Roger TRANCIK (1986; p. 101) would qualify such features as part of the urban solids, which serve as centerpieces in the city fabric. They are often freestanding and surrounded by open space (the piazza or city square). The dualistic aspects of (architectural) mass and void come to ahead here: they work together to support the ‘monument’ as the culmination of their eternal struggle. The short overview of monuments, which is given here, will focus mainly on the latter, more limited interpretation of the term. The definition will be that of a deliberately built structure with the intention to convey a message of importance. In other words, not something, which is historically grown to become a ‘monument’, but a primary structure, intended to be a hallmark. Again it would be an impossible task to cover all the monuments, since nearly every town or village in the world has an object with a special importance, which could be classified as a monument. Just to do justice to this immense number of places of remembrance only one example is chosen as a tribute to all other similar local efforts. A bronze statue of a traveling man, made by the sculptor Ron Adamson, on the corner of the old Route 66 and Kinsley Avenue in Winslow (Arizona) has all the characteristics of a monument in its pure local sense (fig. 439). ——————- ‘I’ve got seven women on my mind. ——————– Take it easy, take it easy. This numerological theme has a distinct reference to the ‘Seven Steps to Heaven’, the title of an album by the jazz trumpet player Miles Davis, first recorded in April 1963. It can also be compared with the medieval three- and four-fold division of knowledge (trivium and quadrivium) and John Scotus Eriugena’s unification of the lower and higher kind (see also p. 541). Standing on a corner might not be so as innocent after all… It is noted that the name ‘quadrivium’ is derived from the crossing of roads and was first used by the Roman philosopher Boethius (c. 480 – 525 AD), writer of the booklet ‘Consolation of Philosophy’. The La Posada Foundation probably did not have these historical references in mind when they decided to put Winslow back on the map. This onetime pearl of Highway 66 had shifted to near oblivion after the continental highway bypassed the town. Action was needed. 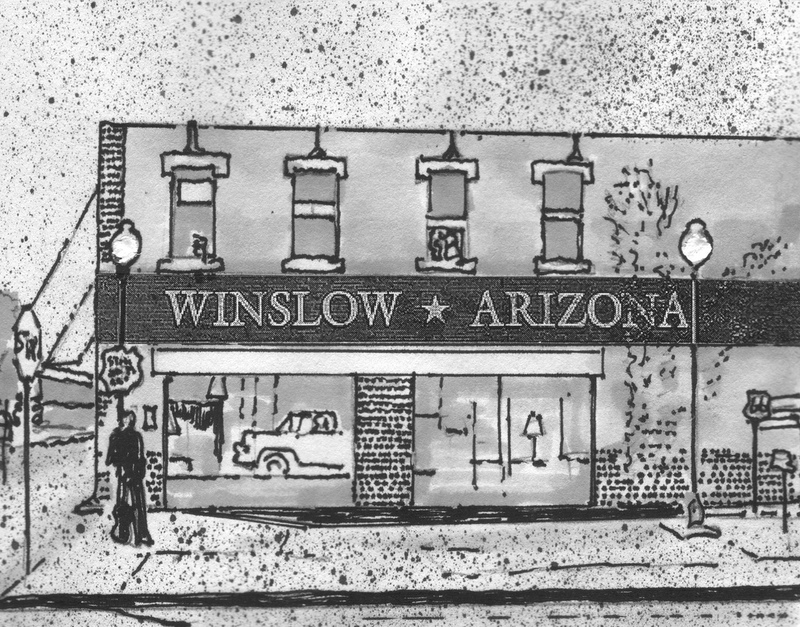 They decided to revitalize the town of Winslow, thereby finding support by its short claim to fame in the song of ‘the Eagles’. A ‘Standin’ on the Corner Park’ was the result of these efforts with a mural by trompe l’oeil artist John Pugh – showing the girl in the flatbed Ford – and a 1970’s man standing on the corner with a guitar by sculptor Ron Adamson. The monument is – like in many similar cases in towns and villages all over the world – a link of the local community to the global community, telling them of their own history and importance. The principal intention of every monument is a contribution to the search for a personal or collective identity. Fig. 439 – A bronze statue called ‘Standin’ on the Corner’ or ‘Easy’ on the intersection of Kinsley and Historic Route 66 in Winslow, Arizona (USA) commemorates a line in a song of the rock group ‘The Eagles’, which put the small Arizona town on the map. 1. The monument in its basic form is an unidentified remembrance, in one way or another. Every form of consciousness can become a monument if it is interpreted as such. This aptitude of the mind would be called a ‘First Quadrant’ monument, belonging to the invisible invisibility of time. 2. More often the construction of a monument is a complicated mental affair in which the consciousness is pressed to create a monument in the form of an idea or an assemblage of ideas. A sense of history, like some heroic deed in the past, brings in associated thoughts, which can act as a point of reference. 3. The monument, as a visible visibility, is an entity of its own, with an empiric type of reality, surpassing the previous forms of memory or unexecuted ideas. The presence of a material visibility can convey the original set of ideas into a wider field of communication. People are invited to place the physical reality of a monument in a personal context and transpose its message to their own identity. 4. The monument can also make a (cognitive) shift by lifting it out of its designated place into the context of a communication-in-general. The genesis from a moment to a monument becomes the background for further human interchange. This ‘Fourth Quadrant’ perception aims to incorporate the monument into a newly defined communication cycle. All previous and future stages are simultaneously included in this view. The most famous historical monument-for-mankind was probably the now-lost Tower of Babylon (fig. 440). The Biblical story in the Old Testament referred to a large ziggurat, which was called by the Babylonians ‘Etemenanki’ or ‘House of the fundaments of heaven and earth’. Another meaning of the word is given as ‘the temple connecting the sky and earth’. The tower reached its prominence during the reign of King Nebukadnezar II, who held power for forty-three years (from 562 BC to around 604 BC). The structure was ninety-one meters high and was built in seven stages using brick and asphalt for its construction. The historical Tower of Babel could be reached from the principal gate, following the ‘Great Royal Way’, which led to the central ziggurat. It was built as a large step pyramid on a square platform. There were seven floors with external staircases giving access to nine hundred vaults of which six hundred were dedicated to the celestial gods and three hundred to terrestrial divinities. The top floor was completely empty, except for a bed and a table in solid gold, reserved for the national god Marduk. 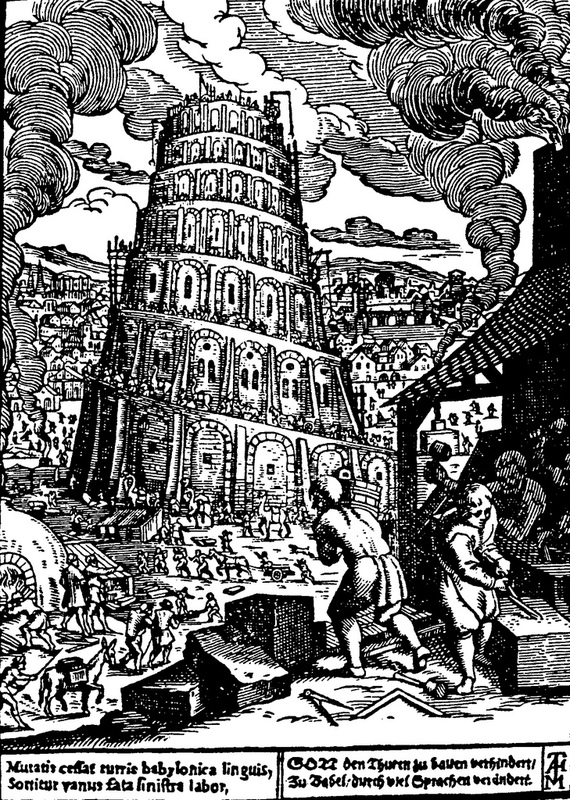 The seven steps or floors of the original Tower of Babel found their way in the European consciousness as the ‘Seven Steps to Heaven’, a now virtually forgotten (theological) concept with a direct link to division-thinking. The Scottish scholar John Scotus Eriugena, living at the beginning of the ninth century AD, was still familiar with the interaction of the three and four division (GARDNER, 1900). The ‘Tao’ of Christian thinking combines the world of the Three-Division, seen as the ‘divine’ way of understanding, with the Four-Division, as a representation of the most suitable ‘human’ way of understanding. Fig. 440 – The Tower of Babylon is seen here in an etching by Marx Anton Hannas. The seven levels of this ziggurat type of tower are connected with the concept of the ‘Seven Steps to Heaven’. The combination of the divine Three Division (higher unification) and the human Four Division (lower unification) led to a full religious and philosophical understanding. The more familiar depiction of the Tower of Babel by Pieter Breughel the Elder (1563) exhibits the structure only half completed, as it was described in the Bible. The Biblical story goes that this act of human megalomania was punished by God. He created confusion in tongues, which prevented the completion of the tower. The sudden lack of understanding resulted in the languages in the world and can be seen as a metaphoric entrance into the world of multiplicity. The Seven Steps to Heaven – as symbolized in the architecture of the Tower of Babel – point to the (spiral/cyclic) way in which a human being can reach the full understanding of its being. The multiplicity of the number seven is divided into two major fields of action (a two-division). The first unit contains four stages (a four division), following the body in its transfer to a (higher) state of being (identified as the soul). The second unit holds three stages (a three division) where the soul is followed into the unknown. The linear movement progresses in a hierarchical setting from the visible (body) to the invisible (soul). The interpretation in a cyclic-quadralectic context would be more dynamic. Either a progressive move (of the body) proceeds from the First (I) to the Fourth Quadrant (IV) or the body makes a retrograde shift from the Fourth (IV) to the First Quadrant (I), taking the various (intermediate) stages of visibility in its stride. The end members (of the body-soul dichotomy) are of equal importance in this approach and both can ‘claim’ a position in any quadrant, depending on the definition and understanding of the observer. 3. From wisdom to the Impenetrable Light. A quadralectic approach can visualize a ‘reverse’ in the way of the Light. The ‘divine’ three-division can be positioned, just like the ‘human’ four-division, in any quadrant of the communication. The various entities will get their very meaning (and type of visibility) according to the place, which is assigned to them. Builders are, like most creative people, men of action. Their concern is the molding of the material into a practical shape and meaning, which can be measured. Their success is celebrated in a world of opposition. This brief elaboration on ancient wisdom in division thinking might look out of place in a book on architecture. However, I believe that the quadralectic spirit owes a great deal to these ancient ‘unifications’. They tell a story of the European understanding of division-thinking in its infancy. The division process offered a road map of reasoning, which could eventually point to an ultimate unity. Early Christian thinkers, like John Eriugena in the ninth century, still had the full specter of division thinking to their disposal and knew their prospects to offer insight in the soul. This intuitive knowledge diminished when the growing urge for visibility and a search for identity caught Europe in the eleventh and twelfth century. The frantic building of cathedrals, fortresses and cities increased a cultural presence, but it reduced the appreciation of higher forms of division thinking. It is only now, with the introduction of a quadralectic view, that the ancient divisions (of Babylonians and Christians) come into a new light – which is not impenetrable. 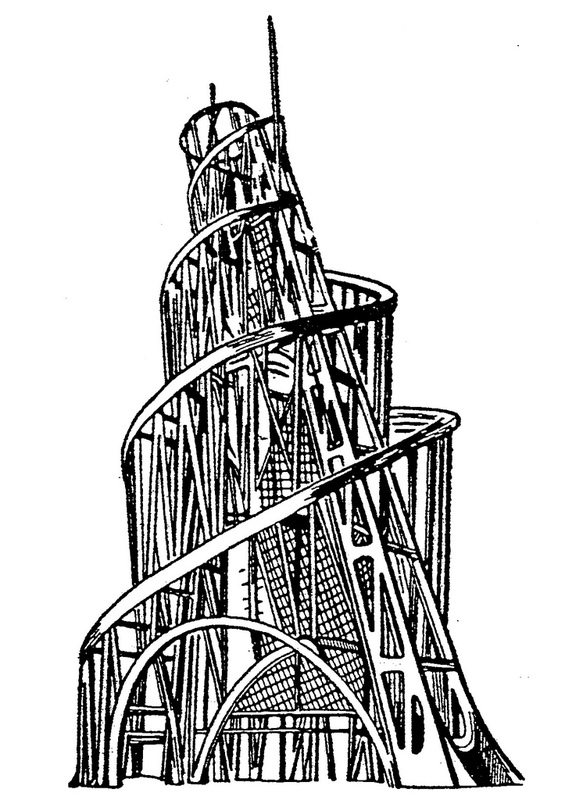 The idea of a spiral tower found a follower in a monument by the Russian artist Vladimir Tatlin (1885 – 1953). 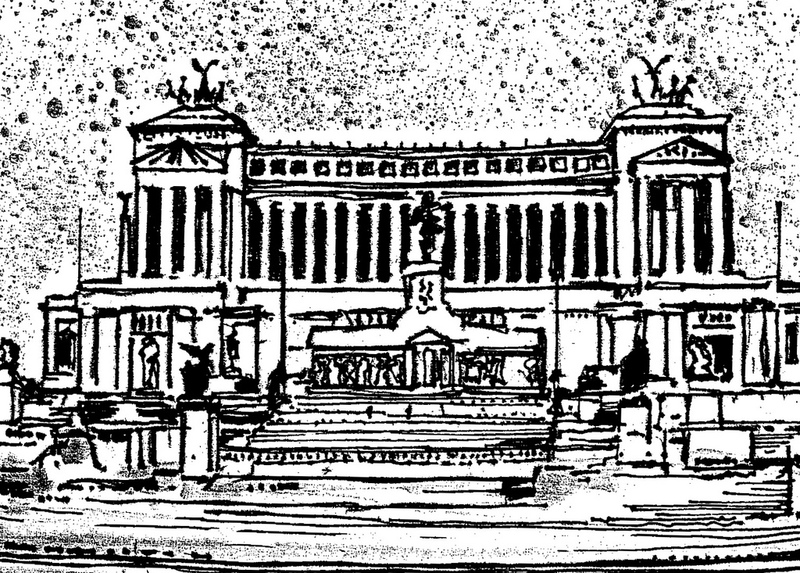 The project for the Third Communist Internationale did never materialize, but still stand out as a masterpiece of sculpture (fig. 441). Tatlin provides in this work an awareness in the various layers of existence, which point primary to the field of higher division thinking and only secondary to the dualism of space. The Swiss historian of architecture Sigfried GIEDION (1941/1967; p. 117) noted that the work of the constructivist Tatlin and his contemporaries was ‘like the Eiffel Tower and some other monuments of our time, a contemporary realization of the urge toward the interpretation of inner and outer space.’ This dualistic interpretation might be too narrow. Fig. 441 – This model for a monument of the Third Communist International in Moscow by Vladimir Tatlin (1885 – 1953) dated from 1920. The spiral outer shape and inner circles and straight lines intertwine in an effective way. The monument was never built to its full size. Many (modern) monuments might point to a ‘quadralectic’ background, if some four-fold clue is present in their visible appearance. The possibility that such a indication is just a numerological peculiarity has always taken into account. Occurrences of ‘fourfold’ monuments on a worldwide scale are so extensive that even a summary would be an immense task – which is outside the scope of this book. The best way to end this chapter is to mention one of the most horrifying monuments ever to be caught in stone. We talk about the monument to Victor Emmanuel II, which was built between 1885 and 1911 in Rome. This huge building, adorned with quadriga’s as mighty symbols of the four-fold, dominates the Piazza Venezia (fig. 442). Count Giuseppe Sacconi (1854 – 1905) won the competition for the memorial in 1884, and work continued until 1922 under the supervision of most of the leading architects of the day, including Sacconi, Koch, Piacentini, Manfredi and Brasini. Fig. 442 – The start of the monument to Victor Emmanuel II in Rome was in 1885. The building was inaugurated in 1911 and completed in 1935. The structure is hundred and thirty-five meters wide and seventy meters high. The quadrigae and winged victories added another eleven meter. This prolific example of a monumental building misses the point of a real quadralectic spirit, which does not seek the extremes.